This past week, I receieved news that at this year’s Scottish Independent Comic Book Awards, The Standard is nominated for Best Comic, and I’m nominated for Best Writer. I was of course delighted to hear this news, but I was almost as delighted to see Best Writer recognition also given to my Glasgow League of Writers cohort Colin Bell, and to see his webcomic Jonbot VS Martha also make the Best Comic shortlist. I have been a fan pretty much since the weekly series began, though I had missed some instalments here and there. Upon deciding to review Jonbot VS Martha this week, I read the whole thing from the beginning to where we are now, and it made me appreciate anew just how great a job Colin Bell and artistic collaborator Neil Slorance have done. As you can see, Neil Slorance’s art is pretty rough and basic? But you know what? It totally works. Yes, there are some inconsistencies: Martha’s hair color changes so often it surely must be a deliberate running gag. But behind the simplicity of the characters and locations, Slorance manages to convey a surprisingly diverse range of emotions on those blank faces, crafting expressions that help a comedy beat hit home precisely. And isn’t that one of the wonders of comic book art? How, with just a few lines, an emotional connection can be established, and a character with heart and personality can be brought to life? Take the eponymous Jonbot. His face is two circles and a line. But Slorance absolutely imbues those plain features with character, and those 2 circles and a line can convey a wide range of emotion. A lot could be written about how much of that comes from Slorance himself, and how much of it is us mentally filling in the gaps, but that’s the topic of another piece, not this review. As a final example of Slorance’s contribution, allow me to point to one of the best chapters of Jonbot VS Martha thus far, a psychadelic dream sequence that takes the form of an artistic jam session, a different artist drawing each panel, including a couple of familiar faces I’m fans of such as Iain Laurie and Dave Stokes. Some of these images are rendered in far more detail than Slorance’s work, and they look stunning. But still, it doesn’t quite feel like Jonbot VS Martha, and when Slorance comes back in the following chapter, it’s very much a welcome return. In the same way that Greg Capullo has done with Batman (this may be the first time that Neil has been compared to Greg Capullo), Neil Slorance has branded this series with his own specific style, making it very difficult to imagine the story told any other way. But with all this talk about Mr. Slorance, let us not forget Mr. Bell! It’s quite funny, Colin Bell was at our table at Kapow Con giving out free sample mini-comics to promote the webcomic, and they seemed pretty popular with kids. Parents would pick one up and be all like, “Here, Sarah, this is a wee comic with a robot in it!” Oh, those poor children! Though Neil Slorance’s art is quite cute and almost chibi in places, that is delightfully contrasted with Colin Bell’s caustic brand of humour. There’s surealism, comedy so black it borders on bleak (“Daddy probably doesn’t have a soul”) and a liberal dose of bad language. Not for the kiddies, then! Though I’m sure he would ardently deny it, in person Bell is a bit of a loveable grump, a curmudgeon, and that absolutely comes through in his characterisation of Jonbot, so much so that I found it very hard not to imagine Jonbot speaking in Colin’s voice! On this note, also bearing in mind how Jonbot’s relationship with his daughter has grown into the emotional core of the overarching story, and considering that Bell himself is a new father, Jonbot VS Martha is actually a surprisingly personal comic, or at least as personal as a story with robots can be. This relatable quality is likely what gives the series that added layer of depth beyond the laughs, which emerges at times as an almost poignant quality. 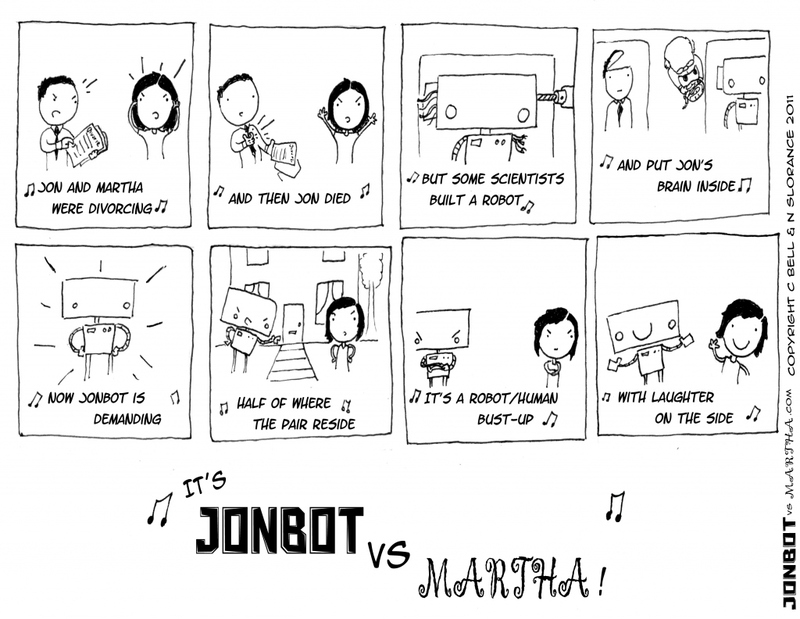 Not that Jonbot VS Martha is short of laughs. The webcomic is regularly peppered with killer one-liners, and in the early stages of the series Bell showed a real knack for pacing out done-and-one stories around concise, precisely-aimed gags. More recently, however, rather than resting on his laurels, Bell has experimented with how the constraints of the format and nature of the story can withstand a more longform narrative, with compelling results. Colin is perhaps best known as a commentator on comics, writing reviews and articles for Newsarama and other sites and blogs, so it’s interesting to see how someone who clearly knows his stuff from an analytical perspective applying that knowledge to making a comic of his own. I’m definitely keen to see Colin Bell turn his storytelling skills to more ambitious projects in the future. 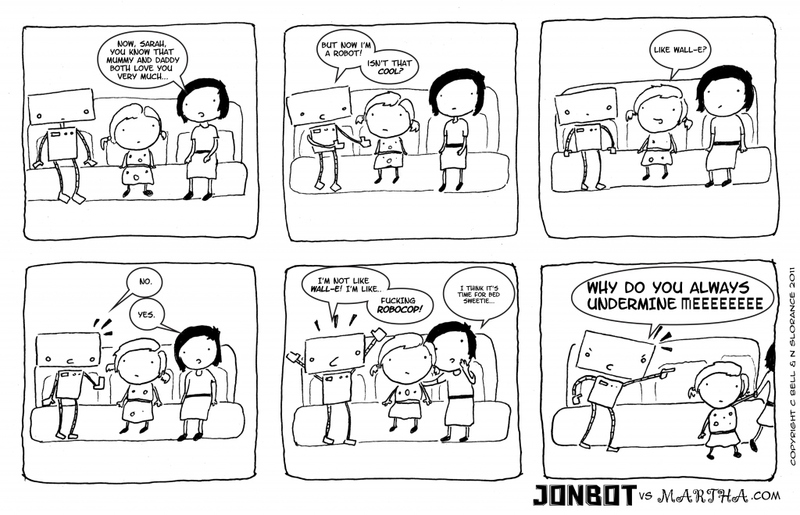 Jonbot VS Martha is one of my favourite webcomics, and I for one can’t wait until a bit more material is compiled, and we see it collected in a nice printed edition. It will most definitely be an addition to my bookcase. Until then, check out the webcomic for yourself, and see why it’s very deserving of its award nominations. Jonbot VS Martha can be read online here. The COZ Top Ten of 2012!